So you’re in the kitchen feeling a bit peckish and you spot the biscuit tin. My biscuit tin had previously been looking after some elderflower and white chocolate shortbread but was there any left? Yes. Yes there was some left, but just one piece. Should I eat it myself and snub all knowledge of its existence? Unfortunately as I was plotting how to cover my tracks my other half walked in to the kitchen with a similarly devilish plan. I think for a moment we both considered lunging for the tin and throwing all sense of caution out of the window. I’m glad this didn’t happen as one or more of us would probably have ended up with crumbs in our eyes and shards of shortbread embedded in our forearms. We both profusely and passionately denied our desire for the shortbread claiming we wanted the other one to eat it and the selfish thought of eating it ourselves had never crossed our minds. Seeing as how this was a battle of politeness I suggested we have half each. It’s not quite the same though really; three bites instead of six just didn’t seem worth it. Whilst discussing what should be done with the, now time consuming, situation I had been gallivanting around in the fridge. The subsequent dessert that was envisaged and created meant that neither party lost out and, if anything, gained even more delight than a solitary piece of shortbread might have delivered. Start by whipping the double cream and a spoonful of elderflower sugar together until you have nice firm peaks. Layer the cream and raspberries up in a bowl or glass. There are only so many raspberries you can arrange when you’re gasping for dessert. Top the pudding with crumbled up shortbread. Dive in and divulge. What started as a difficult decision ended up being a glorious result. 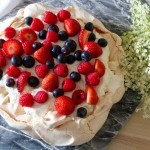 Double cream is always welcome as far as I’m concerned and the creamy, fluffiness works wonders with the flavourful and acidic berries. The shortbread added a fantastic crunch with the pieces of white chocolate bringing added luxury to what was already a heavenly dessert. Mmmm….. lovely, especially with the elderflower sugar. Mmm, I love easy desserts like this! Looks gorgeous! Fantastic! Wonder if we have elderflower here? Must investigate! I always need dessert and this looks beautiful. The reward of sharing looks sinfully delicious! This would be such a perfect end to a lovely meal! I find raspberries and cream as good combination as strawberries and cream.. 😀 maybe even better..
Ha! Brilliant, I have similar battles at home, and what a wonderful resolution. Hahaha what a funny situation, but what a lovely way to resolve this! It’s cute that both you and your other half are greedy in the same way and at the same time, but both wanted to share anyway (: The recipe is lovely, simple but delicious, and of course, raspberries now are just gorgeous and bursting with sweet juices, yum! This is SO funny–David and I have had similar arguments over the last brownie, piece of cheese/bread, etc. What a fantastic-looking dessert, and I adore white chocolate. This is my kind of dessert. Light, fresh and delectable. This sounds like just my type of dessert…creamy, sweet, crunchy on top…plus the wonderful flavors of elderflowr and raspberry! Love it all :)! So pretty and light looking! 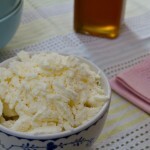 I too love contrasts in desserts, crunchy, creamy etc and am so curious about elderflower now. Awesome recipe, proper use of ingredients and leftovers. great dessert made with leftovers. My husband and I have similar fights over the last slice of cake/tart. You are very kind to settle the discussion and create another fabulous recipe. Great idea and this is a simple transformation for a lovely dessert. I guess I can use brown sugar because we don’t have elder flower sugar over here. I have never heard of elderflower before! Oh the stuff I learn on your blog! This looks perfect! This looks absolutely delicious! Perfect for the hot weather I am experiencing now. 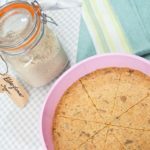 Love the idea of elderflower shortbread and certainly makes a real cranachan style dessert treat. Nifty, thrifty idea. I’ve been meaning to make elderflower macarons which would go so well with this! Cream, berries and shortbread is one of my favourite combinations and with your devilish addition of elderflower this is an inspired creation and one I would have wolfed down with no problem at all.